No Retreat no Surrender... the Swedish Death Metal war machine Demonical is back to conquer all! With "Black Flesh Redemption" the death metal Gods have been unleashed to torment your ears with pure DEATHruction! This band has been spawned upon this world in March 2006 by former Centinex members, this with the mission to return to the roots of death metal and deliver to the metal world a sheer dose of darkness and brutality! Their discharged sound feels like a death metal commando artillery being shoot straight towards their listeners! 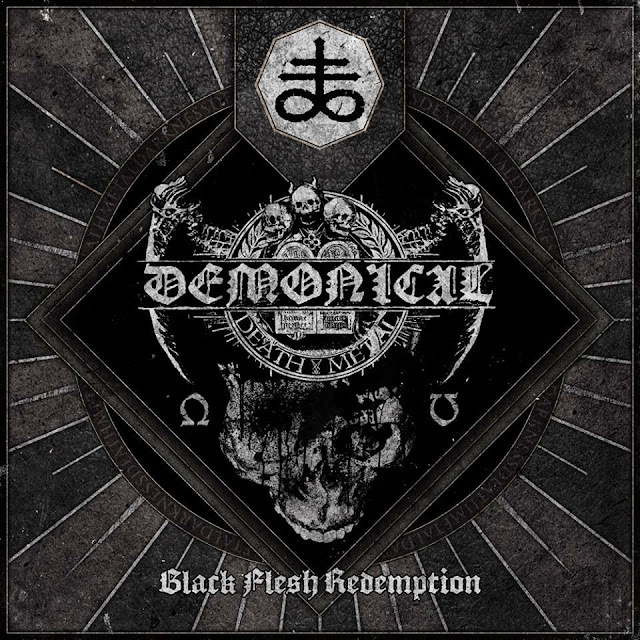 Demonical are without a doubt one of the best bands in their genre, unbound and unchained this new EP reveals some of their best and most vicious sound to the date, an authentic Swedish death metal hammer! "Black Flesh Redemption" is an addicting as well as intense EP; it's hard to listen to it just once! While tracks like "Cursed Liberation", "Drown in Flames" unleash some killer and traditional old-school death metal where all hell breaks loose! In the other hand "Throne of Perdition" song slows things down a bit and go deeper into this rotten pitch-black death infected art. This EP ends up brilliantly with "To Become the Weapon" that expresses Demonical's killer dark formula at its best, for me the most grandiose track on this smashing release! In all this EP is a great follow up to the highly acclaimed "Darkness Unboud" album of 2013! Stockholm death metal darkness at its best! Demonical refreshed formula puts this band on top of what is being done on today's death metal universe! Victorious this pitch black old-school death metal commando conquers another battle!